When that bridge over troubled water is destroyed by enemy artillery, you're going to get your feet wet. Unless, of course, you've brought an Amphibious Bridging and Ferrying System along—then, you just float your own crossing right over the river. 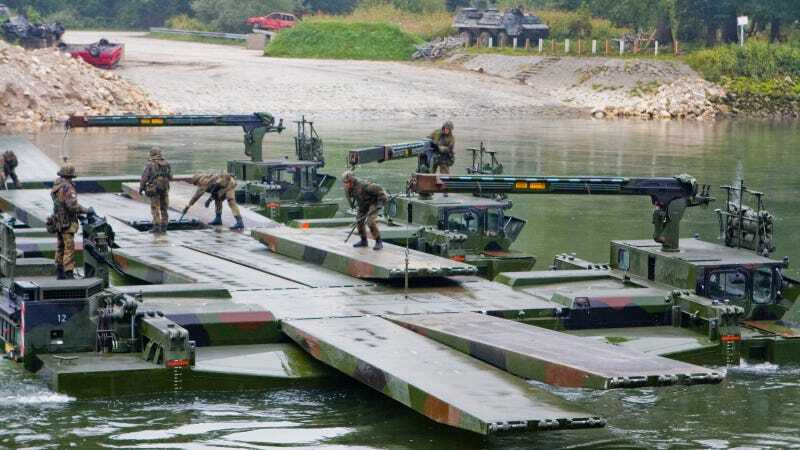 The Amphibious Bridging and Ferrying System M3, built by General Dynamics, is billed as the most technologically advanced way to traverse a river. It's the result of over 60 years of development. Back in the 1950s, the French Army commissioned the very first Amphibious Bridging System (ABS), the GILLOIS-EWK, from General Dynamic's predecessor company, EWK. By the 1970s, the inflatable rubber pontoons that kept the GILLOIS afloat had been replaced with aluminum fairings that acted as part of the temporary road with the introduction of the M2 system. The M2 then became the go-to technology for European forces for the next two decades. By the time General Dynamics began development of the M3 in 1982, newer and heavier classes of armored vehicles were beginning to push the M2 to its structural limits. However, the final prototype wasn't delivered until a full decade later, in 1992. And it wasn't until 1996 that the vehicles actually entered service with the German and British armies—though both the Taiwan and Singapore militaries have since adopted them as well. The M3, just like its predecessor, has become the defacto standard for military bridges thanks to system's high degree of automation and quick deployment with minimal manpower requirements. The M3 is, essentially, a portable road carried on the back of a truck. Well, not so much a truck as a 28-ton, 43-foot long, 11-foot wide, off-roading beast powered by a 400HP Euro III standard diesel engine. It has 4WD, dual steering axles, and can climb 60-degree slopes without breaking a sweat. On land, it convoys at speeds reaching 50 MPH. In the water, a pair of 360-degree water jets propel it along at about 9 MPH. To deploy the M3, one simply drives it into the water and extends the pontoons. The water pumps steer the machine as it floats and helps counteract currents up to 11.5 FPS.